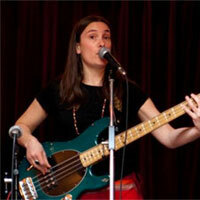 About The Artist: Mariana is a children’s music composer and performer. She sings, plays guitar, bass and percussion. Her songs are fun and educational and will make you dance to the rhythms of rock, reggae, blues, tango and folk in a bilingual adventure. You will dream about the land of the woodpecker, bumpy horsey rides, the ugly duckling who was really a flamingo, the old lady at the Christmas fair, the numbers that play chess and many more fun stories!